Home › Podcast Episodes › TMN027 – Yarrrr! This may ruffle a few feathers. What do you think? Be a sport and leave a “Recommend” (♥) and some feedback on the article, like our friend @niel…! This week is Part 1 of our conversation with Fox Sports South Art Director Carnese Jackson about retouching and compositing in Photoshop. Among other things. Check out the last part of this week’s episode for a little secret on how we created this week’s cover. You didn’t think we were just hanging around the Multimedia Ninja offices sipping lattes all day, didja? 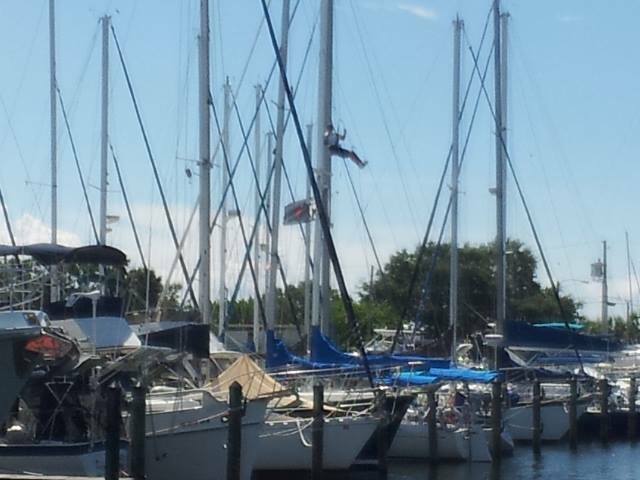 In fact, yesterday I was busy hanging around OVER our Mobile Production Facility™ (aka s/v Jacie Sails.) Yep, that’s me. Turns out some real-life ninja skills are handy as well.